You’re driving along one of the most scenic routes in Norway. The views are breathtaking. But, as is often the case on road trips, you feel that it’s time for a rest stop. Actually, you need the loo. And what better place to stop that the place you see in the image above. 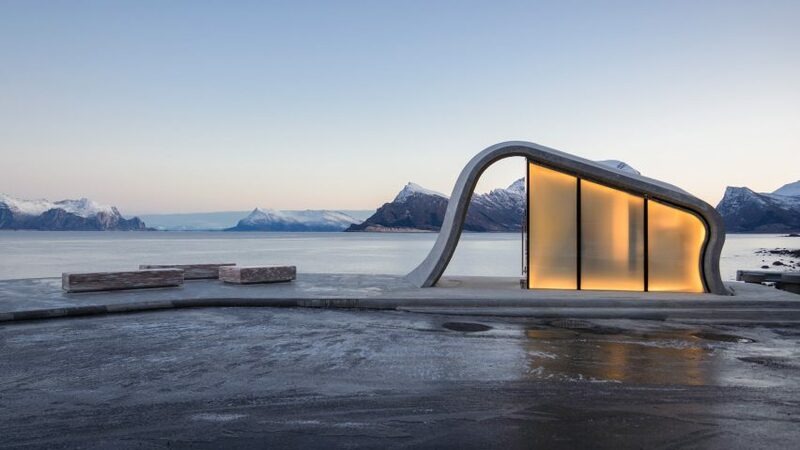 Yes, that wave-shaped building you see is there specifically to meet your needs. And forgive me if I suggest that it might be one of the most gorgeous public toilet buildings in the world. The surroundings help enormously of course. You can also enjoy (afterwards presumably) sweeping panoramic views of the oceans and the mountains. There are also benches where you can sit and consider these wonders. Also on site is a World War 2 memorial to the 42 crew members of a Norwegian submarine that sank just off the coast here.